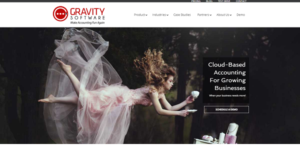 Gravity Software is a cloud-based accounting business management software that is exclusively designed and constructed from scratch using the Microsoft Dynamics 365 platform. Once marketed and distributed as Microsoft CRM, Gravity Software equips small to medium-size businesses (SMBs) with a highly flexible and scalable accounting solution that they can modify by adding unique features and capabilities to meet their business needs and specifications as their business grows. With Gravity Software, users achieve complete, real-time visibility into their business, thus eliminating the need for multiple databases or programs. This functionality enables them to derive reliable information and highly actionable insights, resulting in them making more informed decisions that positively impact margins and ultimately enhance their cash influx. Gravity Software allows you to bring together and consolidate reports, charts, and other data from multiple sources, locations and entities into a single, centralized database. This makes it easy for you to manage business data, generate reports, and derive rich insights as you don’t have to switch from one accounting system to another. Traditional accounting systems are cumbersome and make consolidation a time-intensive process. They also require you to pay a fee per legal entity. Gravity Software lets you enter the first five entities at no cost to you. As your business expands and there is a need for you to add more stores, warehouses, or offices, then there is also parallel need to monitor your inventory effectively. Gravity Software provides you with the ability to monitor, control, and manage your products regardless of your location, thanks to its Multi-Inventory capability. You can define and implement a different set of rules, pricing, and workflows per location. The software gives you total visibility into your inventory and generates custom reports to provide you with deep analysis of your profits, perform reliable audits, and update pricing options for your customers. Gravity Software puts all your financial and CRM tasks, workflows, processes, profiles, and more into a centralized environment. This allows you to meet unique business demands and at the same time deliver personalized and unique experiences to your clients. What Problems Will Gravity Software Solve? A Gravity client was managing its five entities in multiple databases. Gravity implemented its time-saving workflow that allowed users to work in each entity with a single login. This solution allowed inter-company balancing, so users no longer need to add duplicate data entries. Data from all entities are reconciled in real-time reports that can be pulled at a moment’s notice, avoiding the time and inefficiency of pulling reports for each individual entity. The solution integrated with Power BI to create management dashboards for month-end management meetings, as well as present great visuals of data. Using Gravity’s cloud-based solution, Gravity’s client is now able to locate and track quantities of their specific products and components. They can monitor their total inventory, and even drill down by warehouse location. With Gravity’s solution, this client has since maximized its profitability by properly analyzing its inventory. Another Gravity client was having difficulty recording revenue in the period that it was earned. Gravity was able to simplify this process by automatically creating deferral schedules. Users simply had to post the monthly entries and Gravity did the rest. Gravity provides its clients with reliable and accurate financial statements that truly represent revenue and the associated costs that have been earned. Companies have diverse wants and requirements and no software platform can be just right in such a condition. It is pointless to try to find an ideal off-the-shelf software app that meets all your business wants. The wise thing to do would be to adapt the system for your unique requirements, employee skill levels, budget, and other elements. For these reasons, do not hasten and subscribe to well-publicized trendy solutions. Though these may be widely used, they may not be the best fit for your unique wants. Do your homework, check out each short-listed application in detail, read a few Gravity Software reviews, speak to the vendor for explanations, and finally select the application that provides what you want. How Much Does Gravity Software Cost? We realize that when you make a decision to buy Accounting Software it’s important not only to see how experts evaluate it in their reviews, but also to find out if the real people and companies that buy it are actually satisfied with the product. That’s why we’ve created our behavior-based Customer Satisfaction Algorithm™ that gathers customer reviews, comments and Gravity Software reviews across a wide range of social media sites. The data is then presented in an easy to digest form showing how many people had positive and negative experience with Gravity Software. With that information at hand you should be equipped to make an informed buying decision that you won’t regret. What are Gravity Software pricing details? What integrations are available for Gravity Software? If you need more information about Gravity Software or you simply have a question let us know what you need and we’ll forward your request directly to the vendor.